I saw this blood elf parked outside while waiting for arena ques the other night. Yeah, Greg is right. Summoned boss in heroic Setthek for Druid epic flight form quest. 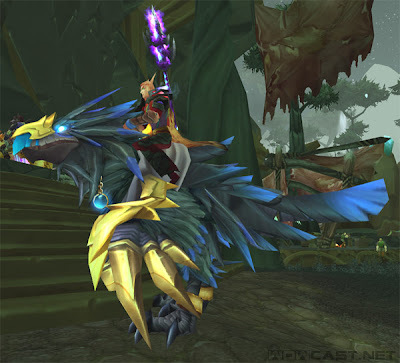 Apparently the drop rate for the bird isn't bad at all, unlike the other mounts (baron's,ZG tiger, ZG raptor, AQ 40 mount, etc.). I ain't got any money, no problem!